As I drove home from work this evening I thought about the tale I would write for you tonight. I thought about all that had happened to me during this difficult day and searched within myself for something good to tell you. Nearing our home for waifs and strays, I was mesmerised by the red scorched sky, sinking behind the fields in the distance. The trials of the day began to fade by the wonder of it all. I sighed as I watched the sky darken, almost as though someone had turned off the light and I switched off the engine. Yawning, I rested my head on the steering wheel and reflected. 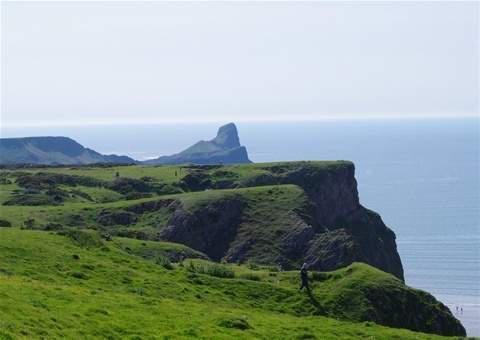 The day had begun with an early morning walk across the cliffs towards Worm’s Head (though I call it Turtle Head) with a flask of my favourite sweet tea tucked inside my rucksack. An earlier downpour of rain followed by sunshine left the air smelling just as sweet as my tea and the murmur of the sea was my constant companion. Thinking about it now, gave me a sudden thought. How lucky as those who have fresh air to breathe and the freedom to walk where they choose. How lucky are those who can smell the sweet air, feel the sun on their backs and hear the murmur of the sea. I think, very lucky indeed. So take time out to smell the air that you breathe and let the rain wash over your face. Take time out to walk in the park and to sit for awhile and do nothing. It’s called living.